Cross items off your to-do list fast. Achieve massive computational performance with a single processor personal workstation delivering support for up to 8 cores and 4 GHz of processing power with Intel® Xeon® processors. 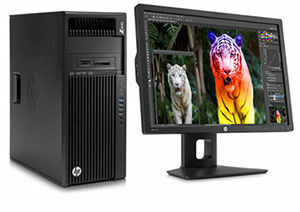 Add in powerful graphics from NVIDIA® or AMD, support for up to 8 displays, lightning-fast data transfers using Thunderbolt™ 2 technology, game changing speed with the HP Z Turbo Drive, and HP Remote Graphics Software and you get a world-class workstation experience that never slows you down. When your job requires more, HP makes it easy. The HP Z440 Workstation, with its sleek 4U form factor, tool-less design, and built in handles makes it simple to expand even in a racked data center environment. Easily configure memory, storage, graphics, and more to suit your needs today and in the future. And you’ll never run out of juice with a choice of two power supply options including a 525W option and a 700W option with two power cables for high-power professional graphics. The tool-free chassis of the HP Z440 boasts low acoustics, single integrated Gb Ethernet, a front handle, rear ledge, storage bays, and is 4U rack mountable. And with HP’s no compromise reliability featuring a standard 3/3/3 limited warranty as well as a long life cycle you can protect your investment and make downtime a thing of the past. And now experience overwhelming silence with the new HP Z Cooler for the HP Z440 Workstation. This innovative, ultra-quiet cooling solution has been designed to reduce system noise in your HP Z Workstation environment so you can focus on your project, even under the most demanding workloads.